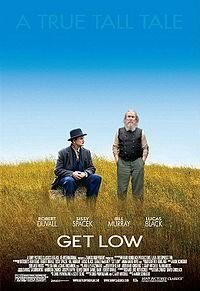 An audience favourite at the 2009 Toronto International Film Festival®, Get Low is a poignant and surprisingly insightful folk tale about pain, guilt, loss and loneliness, and how - if we're lucky - it's never too late to earn a little friendship and forgiveness. Robert Duvall returns to the screen in the larger-than-life lead role of Felix Bush, a notorious hermit who rejoins society only to plan his own funeral party. Felix Bush (Duvall) has lived as a hermit deep in the woods. Rumours about his violent past abound, and he lends credibility to those accounts by brandishing (and occasionally firing) a shotgun when unwelcome guests arrive at his property. One day he walks into the local funeral parlour and announces to funeral director Frank Quinn (Bill Murray), "'Bout time for me to get low. Down to business. I need a funeral." More importantly, he wants a funeral party, an event that will draw all his friends and enemies to his shack in the woods for a final reckoning - and he wants to throw the party while he's still alive.